Acupuncture is a healing art that has been used in China for thousands of years to treat a variety of medical conditions. It is considered the mainstay of traditional Chinese medicine. Acupuncture can be used to treat an endless array of conditions in both humans and animals. Acupuncture may be defined as the insertion of needles into specific points on the body to cause a healing effect. Stimulation of acupuncture points alters various biochemical and physiological conditions in order to achieve the desired effect and to help the body heal itself. Acupuncture has been used for 4000 years on animals as well as humans. As a matter of fact, it is still the treatment of choice for many medical problems for one quarter of the world's population. It is now being used by an increasing number of veterinarians in the Western world to treat a variety of maladies in every species of domestic and exotic animal. It is not a cure-all, but when it is indicated, it works very well. Acupuncture is performed by inserting thin, sterile, stainless steel needles into specific points on the body. Most acupuncture points are located along 14 major channels, which form a network that carries blood and energy throughout the entire body. Acupuncture produces a physiological response. It can provide pain relief, stimulate the immune and nervous systems, increase microcirculation, and decrease inflammation. Acupuncture can also help restore balance between organ systems for optimal health and overall well being. 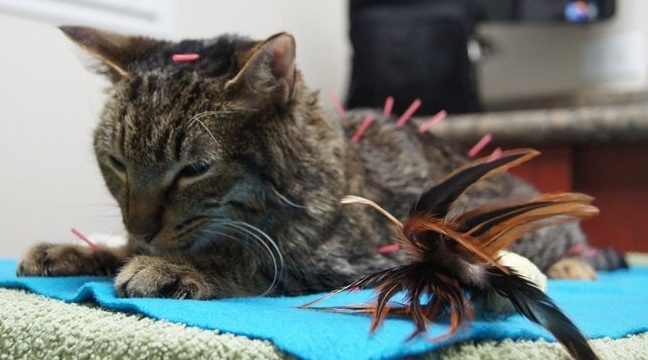 Why use Acupuncture in Animals? Acupuncture and Western medicine have the same goals--to eliminate disease and support the best quality of life. However, each approach is suited to specific circumstances. Western medicine is ideal for acute disease diagnostics and surgery. Acupuncture can be very effective in treating chronic conditions that Western medicine can help but not cure. Traditional Chinese medicine, including acupuncture, focuses on the underlying cause of disease, not just the symptoms manifested in each individual patient. Conventional Western drugs act quickly but sometimes come with unwanted side effects. Acupuncture and Chinese herbal therapy can be used to avoid or ameliorate some of those side effects. By combining Western and Eastern medical knowledge, Dr. Smith provides your pet with the most appropriate and best possible care. Some animals show marked improvement immediately following the first treatment, but most animals typically improve after three or more treatments. Chronic or tenacious conditions may take longer. Treatment length and frequency vary widely depending on the condition being treated. The length is usually between 10 and 30 minutes. A simple acute problem, such as a sprain, may take only one treatment. A chronic condition may need ongoing treatment. For chronic conditions, such as arthritis, a pet may receive 1-2 acupuncture treatments a week for 4-6 weeks. Once maximum positive response is seen, treatments may be tapered to achieve the greatest amount of symptom free time in between. Many patients can be maintained with acupuncture treatments 4-6 times a year. Acupuncture is one of the safest forms of medical treatment when performed by a properly trained veterinarian. Side effects are rare. Some animals, especially older pets, may worsen or appear sleepy or lethargic immediately after initial treatments. These effects are temporary and reflect physiological changes and adjustment. And they are most often followed by an improvement in the animal's condition. Placement of the needles may cause surprise or some pain, but often pets do not notice. Once the needles are in place, they are not painful. Most animals become relaxed and may even become sleepy. 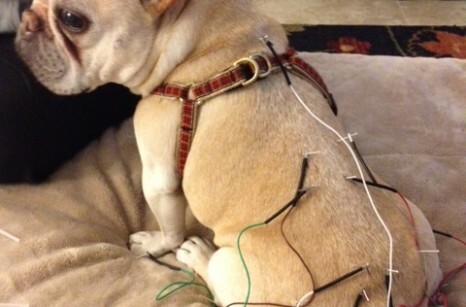 Low frequency electro-stimulation of acupuncture points is commonly utilized for horses, dogs, and cats to assist with returning strength and function to areas of the body experiencing stagnation of energy. The electroacupuncture leads are attached to the acupuncture needles after they have been placed on the patient. The frequency and amplitude are set so low that they are barely felt and the treatment should never be painful.